Further the joint neighbourhood meeting on the 26 November 2009 there are a few comments and concerns I would appreciate you addressing. Firstly,during your presentation you compared Tolworth Broadway with the Strand and Ken High Street, there is no way these two places are on par with the Broadway on a number of levels. Your PowerPoint display was misleading with regards to the number of questionnaires. The presentation only showed the number sent out and there was no display of the results. I have attached the questionnaire results to this email. In total 361 questionnaire responses were received consisting of 290 postal questionnaires and 71 electronic form responses via the Council website. Only 344 from residents’, a very small number compared to the number of households in Tolworth. The questionnaire results showed, 73% walked, 72% felt that the pavements where wide enough and 59% felt it’s easy to cross. Improvements required on 53% on traffic congestion, 44% on car parking and only 25% road crossings for pedestrians. Following these results why is the council pushing ahead with this development? It was also stated by the architect that the payments (footways) were of a very high standard, wide enough for shoppers/visitors and there was no need to change these. Can you please explain why then your have decided to place another walk way down the middle of the Broadway in-between 4 lanes of traffic? I would also be interested if you have carried out a traffic and feasibility survey of the Broadway? As you stated around 9 ‘o’clock, that traffic along the Broadway would be speeding down the Broadway at that time. I find this a little hard to imagine due to the number of traffic lights, CCTV, speed limit of 20mph and also the amount of traffic. There is a high level of population in these area, our MP and two cllrs stood in the Broadway wearing masks and hold up banners “”Clean Air for Tolworth”. In you presentation there was no mention of this or how your design will help reduce the population. How will a walk way down the middle of the Broadway reduce air population? Part of the landscaping was of trees being planted in large containers. Can you confirm how these will be maintained and what the type of tree(s) they will be. In other parts of the Borough new trees were planted along grass verges. Unfortunately the council were hoping for residents to keep them watered, as you can imagine quiet a few trees died. The roundabout design looks very interesting, however I am unable to see how this will work unless the lights on the roundabout are moved. Can you confirm? If the lights have to be moved how this will impact the traffic movement on the roundabout at the moment? The idea is to remove the barriers; are you aware how long it took local residents to get these installed? One councillors stated they are an eye sore but you also have to take into account the council has not carried out any maintenance works on these for over 8 years. Can you confirm how cheap the new layout will be to maintain and how cost effective the layout will be? 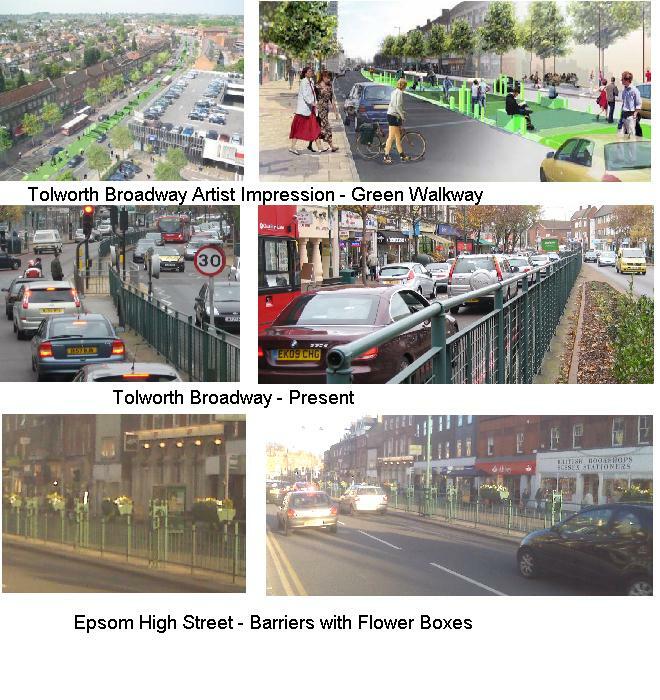 With regards to bring in new businesses into Tolworth how does the council plan to do this? New Malden High Street was redeveloped and ignoring the poor planning, it hasn’t attracted many new businesses; in fact seems to have done the opposite, and is another struggling high street. What evidence does the council have that a green walk way attract new businesseses to the Broadway? Also Surbiton High Street are also looking to redevelope. Another area that was not spoken off was the waste management plan, which may see a site in the Chessington area, and the amount of traffic this may introduce. There seems to be a number of factors that have been missed while putting the plan together. The council must take every angle into consideration. I have attached photos of the design of Tolworrth Broadway which clearly does not give a true picture of the Broadway e.g. Very Few Cars. With photos of how the Broadway normally looks and a photo of Epsom High Street, which also has a barrier down the middle, which clearly is maintained and looked after. Unlike the Tolworth Broadway barrier, which again hasn’t had any works since 2001 apart from remedial works! I look forward to hearing from you just as soon as possible. Totally agree. I was at the meeting regarding changes to Surbiton town centre and was surprised at the done deal. We were not even allowed to ask questions. But seeing as how the Development Control committee has just approved the Red Lion pub development of 50 flats, 1145 sq metres of commercial space (which may or may not include a pub) with cars. lorries entering the site from Red Lion Road and against the residents’ 1 year hard fought campaign, nothing would surprise me again. It is up to residents to make their views known. If people do not bother, changes will be made anyway. You stated “Following these results why is the council pushing ahead with this development? One reason will be money received from the Mayor, or in the case of the Red Lion Pub develoment £50,000 towards improvements in the Tolworth project. Need I say more. Money talks. You presented a really strong case on residents’ behalf at both Neighbourhood and Development Control. I share your sense of disappointment and frustration at the outcome. The impact on Red Lion Road will continue to worry all local councillors. As you know the Surbiton Hill councillors and the Tolworth and Hook Rise members, though of opposing parties, were in complete agreement about this development all along. I had the chance to talk to the Chair, Vicki Harris, after the meeting ended. What concerned us both was not the proposed ‘Section 106’ contribution to which you refer – that would have happened anyway, I feel – but the reasons for refusal stated by the Planning Inspector in refusing the developer’s appeal against the refusal of the first version of the scheme. He picked on some relatively (to my mind) minor reasons for refusal, while praising the aspects of the planned development that most of us found most repugnant. Remember how Neighbourhood reacted? This essentially put the Council on notice that a second appeal wouldn’t be turned down if the matters raised by the Inspector were addressed in a second application. This is what happened and the officer was keen to point this out. I think this weighed very heavily in the minds of many members. They were presented with the prospect of losing an appeal, possibly with costs against the Council vs. a modified scheme with contributions to local projects thrown in. The above comments made interesting reading from a former Tolworth resident (1929-1945). Welcome William. I hope some of your old friends get in touch. Please call me Digger, my family nickname circa 1926. My pleasure, Digger. I thought it might have had something to do with your emigration from Tolworth to NZ – though I think it was more commonly used talking about Australians. I think you’d find Tolworth much changed. Apart from the ‘greenway’, now operational with the Council back pedalling fast and saying it was nothing to do with them, we have also recently lost the iconic Red Lion pub at the Ewell Road end of Red Lion Road. Some of us made valiant attempts to save the building, but it has been replaced by a much less pleasing block of flats with retail space on the ground floor. The new structure has been controversially named ‘Red Square’, bringing forth remarks about Moscow which were to be expected. Kindest regards to you and yours!